The patented LASH® (LEVEL - ALIGN - SPACE - HOLD) System is designed for quick installation and reduces costly call backs by insuring that the finished floor surface is lippage-free. This time saving system helps adjust the height of the tiles and evenly holds their edges throughout the curing process of the setting material. Clips and Wedges Sold Separately. BRUTUS re-usable Tile Spacers provide quick, professional looking results for any tiling job. Wedge Tile Spacers are designed to create even horizontal tiling lines on vertical surfaces. 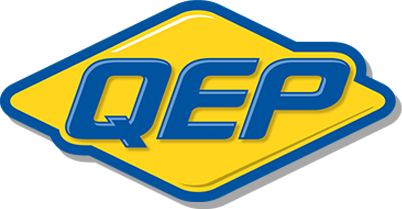 QEP re-usable Tile Spacers provide quick, professional looking results for any tiling job. The Economy Trowels are designed for the do-it-yourself installer in-mind. This trowel features a cold-rolled steel blade, available in a number of notch styles. The high quality 12" Super Scraper is made for removing tough debris. The solid fiberglass rebar base supports twice the workload of standard fiberglass scrapers. Quickly remove old flooring and debris with the Reversible Demolition Scraper. The unique reversible and double angle design is perfect for scraping away in tight, stubborn areas. The Surface Scraper has a flexible 14" blade that helps remove old floors and clean up excess debris. Replacement Blade for QEP 20900Q Surface Scraper. The Heavy Duty Floor Scraper has a thick, professional high-carbon steel 7" blade that scrapes up concrete, marble, ceramic tile and wood floors. Replacement blade for QEP 75006Q Heavy-Duty Floor Scraper.